A few days ago, my Greek professor at Shepherds posted a review of the BibeWorks Manuscript Project. If you are not aware of the project, this review will be helpful. 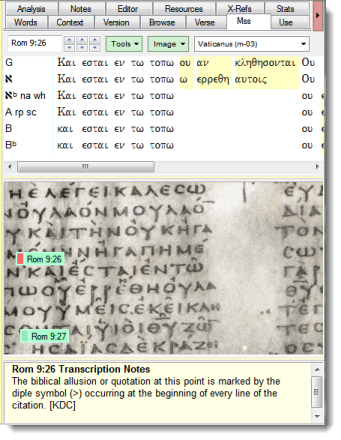 “According to the BibleWorks 9 Help text, the Manuscripts Project (started in 2004) has the following goals: (1) to provide “new transcriptions of the most frequently cited Greek New Testament manuscripts” with accompanying manuscript images that are tagged according to verse; (2) to provide morphologically tagged and fully searchable transcriptions; and (3) to provide tools to aid with manuscript analysis and collation.” As both a former software designer (with a B.S. in Computer Engineering) and a highly trained textual critic, there are few people who are as well equipped to review this tool as Dr. Smith. To read his review click here.